Have you ever needed wisdom to know how to handle a situation and then asked God for it, but then went about your own way trying to deal with the problem in your own understanding? I think we’ve all been guilty of doing that. We pray and then immediately go out and try to solve the problem through our own way of thinking and acting. Sometimes, we don’t even give God time to answer the prayer. It’s almost as if we have already made up our minds to do it a certain way, but we need to do our “duty” in praying for wisdom so even though we know what we’re going to do we “cover” ourselves by praying. James says here that when we ask for wisdom we can know that God will give it! It’s an assurance that He wants to give us the wisdom that we need to solve our problem. 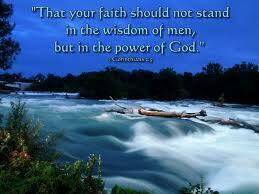 But there’s a condition to receiving that wisdom…..we must ask in faith, without doubting! Hmmm…..that changes things, doesn’t it? Ask – Greek word aiteo – Strong’s #154 – means to request, petition. The word usually describes a suppliant making request of someone in a higher position, such as an individual asking something from God, a subject from a king, a child from a parent, or a beggar from a person of substance. The word denotes insistent asking without qualms, not “commanding” God, but solidly presenting a requisition whose items He longs to distribute. I like the last line of that definition “the word denotes insistent asking without qualms….”. We ask God because He wants us to come to Him for wisdom. We don’t have to worry that we will not be received; He is waiting for us to ask; “….not “commanding” God, but solidly presenting a requisition whose items He longs to distribute.” This statement reminds me of my years in the mortgage lending business. I often distributed funds from construction loans where it was needed to pay for work that had been done. The funds were waiting to be distributed. It’s like having a checking account. In the banking industry a checking account is known as a “demand deposit account”. When you write a check you are making a demand on the deposit in that account. When I paid funds out of a construction loan I made demands on the funds that were available in that loan. God’s wisdom is available to us for the asking. We make “demands”, not as in demanding that God do it, but as in making a request on the deposit that we have in Christ Jesus. He is waiting for us to make a demand on His wisdom so He can fulfill the request! We often don’t give Him time to send the “funds”. But if we don’t ask in faith we really don’t believe that He will answer so we rush out and do it “our way”. We subconsciously doubt that He will give us what we have requested of Him. Doubting – Greek word diakrino – Strong’s #1252 Has two definitions: 1) To judge thoroughly; to decide between two or more choices; to make a distinction; to separate two components, elements, or factors; to render a decision; to evaluate carefully. 2) the word also connotes a conflict with oneself, in the sense of hesitating, having misgivings, doubting, being divided in decision making, or wavering between hope and fear. In this verse of scripture, using the illustration of the one doubting being like a wave of the sea driven and tossed by the wind, I would say that the 2nd definition is the one in which James is referring. 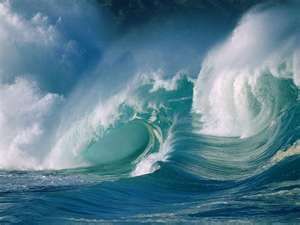 Ocean waves, when tossed by the wind, move in different directions, one going this way and another a different way. The one who doubts is driven by their emotions; sometimes having hope that God will do what He has promised and other times being fearful that He will not come through for him. This causes a division in the mind, a mental conflict and a hesitation in believing God for what they have requested of Him. Faith and fear cannot co-exist. You either have one or the other. James goes on to say that the person who doubts cannot receive anything from the Lord, because he is a double-minded man and is unstable in all his ways. Wow, that’s quite a statement! What does it mean to be double-minded? A double-minded man is a person who is drawn in two different directions. One minute he’s believing God and the next minute he’s wondering if God’s word is really true, did he really hear God correctly and will God really do what He has promised. James says this person is not only unstable in his prayer life, but his instability portrays a lack of consistency in all areas of his life. He is unstable in all his ways; emotions rule and reign in his life, when God’s word should be the deciding factor in which direction he takes. So, how can we become “stable” in all our ways so we can be people of faith, not doubt? I am reminded of the story in John 20 where Jesus addresses Thomas’ inability to believe. We get the name “doubting Thomas” from this story. Notice that Thomas said he had to see to believe; not just that it was needed for him to believe, but that he would not believe until he saw and felt the scars in Jesus’ hands and side. “I will not believe”, he said. He was using his choice to believe or not believe to be ruled by what he saw; the sense realm. Jesus said it took Thomas’ seeing in order for him to believe. There can be two camps in the realm of believers: those who have to see to believe, which I refer to as “unbelieving believers” and those who, by faith believe what God has said without having to see it first. Thomas was an example of an unbelieving believer. His realm of belief only went so far. He knew the Lord, was one of His disciples so he had been around Him, had seen the miracles that Jesus had performed and yet when it came time for Jesus to be out of his sight, he couldn’t draw on what he knew to be true to enable him to believe without seeing it happen in the natural. We can be like Thomas and have to see to believe or we can be as Jesus said “more blessed” because we believe without seeing. The foundation for our belief comes from what God has said in His word. The truth and the yardstick of our measurements should be what we read in God’s word, what He speaks to us through His Spirit and what we know of His character and nature. When we base our belief on Him and His word we will become “stable”, fixed and unwavering. It was said of Abraham that he believed even when it appeared to be untrue because of what he saw in his body and the deadness of Sarah’s womb. He believed, even when it didn’t look like it would be possible, because he put his trust in what God had said, what He had spoken to him. Romans 4:19-21 And not being weak in faith, he did not consider his own body, already dead (since he was about a hundred years old), and the deadness of Sarah’s womb. He did not waver at the promise of God through unbelief, but was strengthened in faith, giving glory to God, and being full convinced that what He had promised He was also able to perform. Abraham’s success came through his faith in God’s ability to perform what He had promised. He knew that God would do what He said, even when the natural ability to bring it into existence where he and Sarah where concerned was not there. The reality of the promise did not rest on his or Sarah’s age or his ability to perform sexually, but it rested on God’s ability to perform. Faith believes God, not what is seen, felt or thought through the senses of man. Stability in our faith walk comes through hearing the Word of God, believing it and acting on it. Do you need wisdom from God to know how to live life successfully? Ask Him and then believe and act on what He says! Allow your faith to be grounded in what He says in His word, not what you see around you. Faith grows just like a muscle, through use. If you can’t believe God to provide for your monthly bills, how can you believe for a new house, new car, or a multimillion dollar ministry? If you can’t believe for the healing of a headache, how can you believe for supernatural healing of a terminal illness? You begin small and as you exercise your faith and hear more of the word of God, your faith grows and you are then more stable and have the ability to believe for bigger challenges. There are no limitations to a person’s faith ability! God will take you to wherever you exercise the faith in believing. He will be to you everything that you can believe Him to be. Jesus challenged the ruler to look away from the negative report that he had just received and look unto Him in faith believing that what He said He would do and his daughter would be made well, which included being raised from the dead! Jesus said she was just “sleeping”, not dead! Faith moves beyond the natural into the supernatural! What do you need to believe about your life today? Is is for healing, financial provision, wisdom to know how to move in a certain situation? Whatever it is, God has it for you! Will you believe Him today? Father, I thank You for the wisdom You have for us for the asking. I thank You for being a God who longs to give to His children what they have need of. Thank You for not withholding any good thing from us as Your children. Thank You for being faithful to Your word so that we can place our trust in what You say and know that You will perform what You have promised. Father, I pray that our faith will be strengthened as we read and study Your word and listen to Your voice. I pray that we will find our stability for faith in You, through hearing and practicing Your word in our lives for the little things so we can believe for the bigger things that You have promised. Thank You for not giving up on us but for being patient in helping us to grow and be rooted and established in You so we can walk by faith and not by sight! May we be blessed in believing without having to see first. Thank You, Father, for hearing and answering my prayer. I believe I receive when I pray in Jesus’ name! Amen. Kitten or Lion; Grasshoppers and Giants? Numbers 13:26 Now they departed and came back to Moses and Aaron and all the congregation of the children of Israel in the Wilderness of Paran, at Kadesh; they brought back word to them and to all the congregation, and showed them the fruit of the land. They they told him, and said: “We went to the land where you sent us. It truly flows with milk and honey, and this is its fruit. They went into the land and saw that it was just as God said it would be; a land flowing with milk and honey; a land flourishing with large fruit. God had promised them their Promised Land and it was true, just as He had said! But……even though they saw what God had promised the giants that lived in the land were bigger than the promise of God and they didn’t see any way past the giants! The thinking that kept the Israelites from entering the Promised Land was that they did not believe God but believed what they thought about themselves. Their mentality about themselves put restraints upon their ability for success. They saw themselves as grasshoppers and the giants as being bigger than anything they could conquer. They did not believe that because God was giving them the land that He would certainly enable them to defeat the giants and give them the victory in conquering them. They believed a lie over the truth! They saw themselves in a negative light and it affected everything they wanted to accomplish. How do you see yourself? Do you see yourself as who God says you are or do you measure your worth and your ability to succeed by what is going on in you and around you in your life? Are you more than a conqueror in Christ Jesus as God says you are, or are you living “under the circumstances” of the problems of your life? 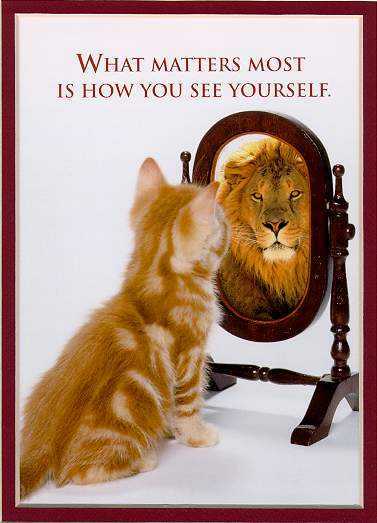 How you see yourself will determine where you go in life. Truth always supersedes fact! The truth of God’s word is what we need to use to determine our worth and ability to perform not what we see happening in our lives or the success or defeat of what we have attempted to do through our own talents or abilities. Past failures do not determine your future success! You may have failed in something, but that does not mean you will have a repeat performance in upcoming challenges. Paul said in Romans 8:31: What then shall we say to these things? If God is for us, who can be against us? God sees us as more than conquerors through Christ Jesus! He is for us and if He is for us then who can stand against us? The Israelites were limited in what they could do because of their preconceived thoughts of themselves. They believed what they saw over what God said. They were walking by their senses instead of by faith. They could not enter into the Promised Land because of unbelief. Hebrews 3:16 For who, having heard, rebelled? Indeed, was it not all who came out of Egypt, led by Moses? Now with whom was He angry forty years? Was it not with those who sinned, whose corpses fell in the wilderness? And to whom did He swear that they would not enter His rest, but to those who did not obey? So we see that they could not enter in because of unbelief. God did not let them enter into the Promised Land because they did not believe Him. He said they could not enter in because the word that they received was not mixed with faith. They didn’t take what God said as the truth; they looked at their situation and believed it over God’s word. The word that God gave them about their situation was mixed with fear, not faith, and so it did not benefit them the way it should have. God was not pleased with them because they did not receive what He said with faith so that they could have what He had promised. We have to mix faith with the word of God. If He says we are the righteousness of God in Christ Jesus, then we must mix faith with it, believe it and act on it. Whatever you see in His word that describes who you are in Christ Jesus is what you must mix with faith to cause it to be profitable for you. If you believe your own thoughts or what someone else thinks about you or how you feel at the moment or the negative that you see happening around you, you will not succeed because how you see yourself determines where you go in life. Proverbs 13:7 For as he thinks in his heart, so is he…..
How we see ourselves in our hearts is what we will speak out and act on. When we believe what God says about us we will begin to speak it out and act on it. Then we will have great success! Father, I thank You for encouraging us to believe You above all else. You speak the truth about Your children and You expect us to believe that truth and receive it into our hearts so we can be all that You have created us to be. I pray for my friends today that might be struggling with low self-esteem. I pray, Father, that You will reveal to them just how important they are to You; that they might see that You gave everything for them; You gave Your very own Son to die for them that they might have eternal life. That is the greatest gift anyone could have given anyone else. Father, may they see themselves as You see them. Help them to receive the truth in Your word about themselves instead of the lies of the enemy. Thank You, Father, for showing them who they are in Christ Jesus. I pray these things in the name of Jesus. Amen. This is how God thinks of us every morning. It is because of His mercy that we are not condemned; His compassions that do not fail. They are new every morning. When God looks at that one who has placed His trust in the Lord Jesus Christ for salvation, what He sees is the blood of Jesus covering him. He sees what Jesus did on behalf of that person that cleanses him from sin. 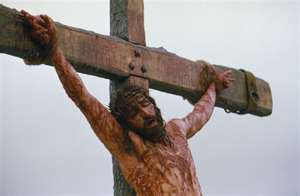 God loved us so much that He gave His only begotten Son that we might not perish, but have everlasting life! This should give us hope! When we get up in the morning we should just thank the Lord that His grace has been extended to us; His salvation has made us whole; we have been forgiven. Mercy – Hebrew chesed – Strongs #2617 – kindness, mercy, lovingkindness, unfailing love; tenderness, faithfulness. God’s mercy is His unfailing love expressed through kindness, tenderness and faithfulness. His compassions are new every morning. Compassions – Hebrew racham – Strong’s #7355 to fondle; to love, have compassion upon, to have pity for. God’s mercy causes Him to show tenderness to His children like a parent who would pick the little child up and hold him close to His heart, fondling or caressing him as a parent who kisses and holds his child. God sees us as His very own little children. We are precious in His sight. Galatians 4:4-7 But when the fullness of the time had come, God sent forth His Son, born of a woman, born under the law, to redeem those who were under the law, that we might receive the adoption as sons. And because you are sons, God has sent forth the Spirit of His Son into your hearts, crying out, “Abba, Father!” Therefore you are no longer a slave but a son, and if a son, then an heir of God through Christ. Because of what Jesus did on the cross on our behalf we now have a place in the family of God. We, who have invited Jesus into our hearts by faith, have received the Spirit of adoption, or the Holy Spirit, whereby we can now call God our Abba, our Father! We are no longer alienated from Him but have been brought near through the blood of Jesus! It is because of God’s mercy that we are not consumed; His compassions never fail; they are new every morning! Great is His faithfulness! Ephesians 2:19 Now, therefore, you are no longer strangers and foreigners, but fellow citizens with the saints and members of the household of God. Father God, I come before You in the name of Jesus and I confess to You that I am a sinner, both by birth and by choice. I ask You to forgive me of my sins and cleanse me from all unrighteousness. I believe that You are God and that You gave Your very own Son, Jesus Christ, to die for me that I might be saved. 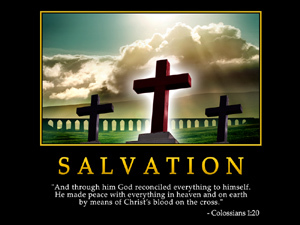 I confess that You raised Jesus from the dead; He is alive today and I confess Him as my Lord and Savior. I thank You for saving me. I vow to live for you every day of my life from this point on. In Jesus’ name I pray. Amen. If you prayed with me to receive Jesus as your Savior I would like to welcome you into the family of God. That is the most important decision you will ever make in your life. You are now “born again”; born of the Spirit as well as of the flesh. Jesus lives within you through His Spirit and will walk with you through every day, every trial and tribulation that you may encounter. You now have a friend that sticks closer than a brother. He will never leave you nor forsake you. Jesus said He has deprived the world of it’s power to harm you and has conquered it for you! Hallelujah! You don’t have to suffer through life’s problems. Pray and ask the Lord what you need to do in your situation to bring you out of the difficulty! He will give you the wisdom and direction you need to win the battle. Just be confident in His power to overcome what you are experiencing. He has perfect peace for you in the midst of the storm. All you have to do is receive it and act on it. Father, I thank You for depriving the world of it’s power to harm us! Thank You for taking the sting out of the problems we encounter. Thank You for giving us the victory through Christ Jesus! We are over-comers in You, Lord Jesus! Thank You for living in and through us to Your honor and glory! In Jesus’ name I pray. Amen. Sometimes my husband points out to me that I am worrying. I’m thankful that God brought him into my life and for him helping me to keep a proper perspective on casting my cares on the Lord and not allowing worry to steal my peace! So, God tells us in this scripture that we are not to worry about anything. Wow, how hard is that? Have you ever caught yourself fretting over something? I think we women especially have a tendency to do that. But God actually gives us a “pattern” to follow for success in this portion of scripture. Don’t worry – instead pray! Tell God your needs – and don’t forget to be thankful for what He does for you! 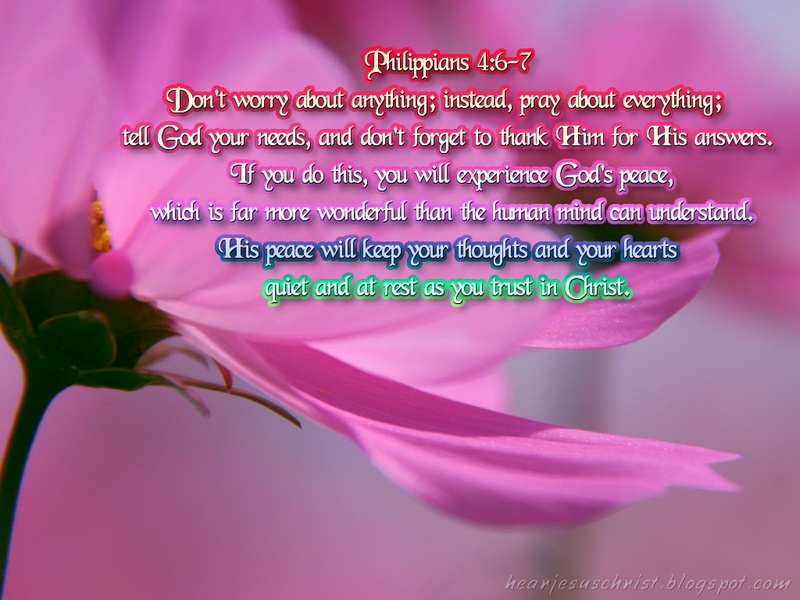 Result – God’s peace will encompass your mind and your heart! Rest – will come as you trust in Christ! Now, how simple can that be? It all boils down to our willingness to place our trust in God and allow Him to handle our problems instead of us trying to do it on our own. 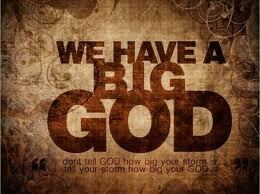 He’s a BIG God; the only true GOD! He created the universe and all that’s within it! Who are we to think we can help Him out by worrying? Jesus says in Matthew 6:34 that when we worry we actually borrow from tomorrow’s trouble. Wow, who would want to bring tomorrow’s troubles into today? Instead He says that when we seek His kingdom and His righteousness, or His right way of doing things, that everything that we have need of that we’ve worried about will be added unto us. What a great exchange…..trading our needs for His provision! I think I’ll concentrate a little more on doing that. How about you? Father, I thank You for always meeting my every need according to Your riches in Christ Jesus. Thank You for handling the things that I tend to worry about. You are so much better at dealing with life’s issues than me. I thank You that when I present my requests before You that You hear me and set my heart at peace. Thank You for always being there for me! And now Lord, I bring my friends before You. So many of them are struggling with their own problems right now and need encouragement and provision for what they are experiencing. Father, You’ve said that You would provide for their needs according to, or in the same measure as, Your riches in glory by Christ Jesus. I pray that they will receive that provision today, Father. And that You will give them an assurance in their hearts that it’s been taken care of and that You are working in each situation bringing the resolution that they have need of. Thank You, Father. In Jesus’ name I pray. Amen. 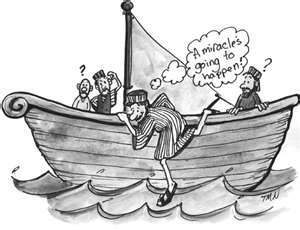 So often we hear the story about Peter walking on the water and we focus on the fact that he sank! But, HEY, he walked on the water before he began to sink. It was only as he looked around him and saw the great waves of the sea and felt the blustery winds that he took his eyes off Jesus and began to sink. Fear over-whelmed him and affected his ability to walk in faith. How many of us have walked on the water? I can’t think of a single time when I was in the ocean or the lake or even a swimming pool when I walked on the water. So why do we condemn Peter for stepping out in faith, after hearing God’s voice, to do the impossible? Why do we focus on the fact that he sank rather than the fact that he walked on the water? We often experience the same difficulty in life’s battles when we take our eyes off Jesus and look at the enormity of life’s difficulties and begin to sink. Our immediate cry is just like Peter’s “Lord, save me!” The water that we are walking on are the “seemingly impossible” situations that we face in our own lives. The answer is found in keeping our eyes on Jesus! Isaiah 26:3, 4 You will keep him in perfect peace, Whose mind is stayed on You, Because he trusts in You. Trust in the LORD forever, For in YAH, the LORD, is everlasting strength. You want strength and peace of mind, the ability to walk on the cares of this life? 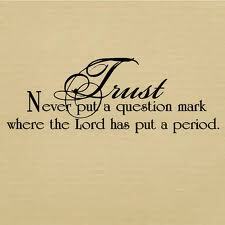 Trust in the LORD! You want to be able to endure the difficulties of life? Look unto Jesus; He is the author and finisher of your faith. He will give you the strength, peace of mind and the faith to win every battle! I realize that very often my blogs have been long and “meaty”. I do not want to overload you with teaching so just as I sometimes have a “snacky” meal instead of a full-blown, 3 or 5 course meal, I think you need to have a “snack” instead of a full-blown teaching. I will at times, then, be posting a short devotional to encourage you or give you something to think about. This is the first of those types of posts! Be encouraged in knowing that God never leaves you or forsakes you. He is always there to encourage you to stand strong in your faith and resist the enemy who wants to discourage you and cause you to sink! 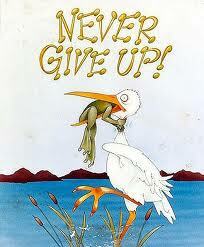 Never give up; never quit and never cave in! “Little faith” — Greek word oligopistos – Strong’s 3640 Small, faith, describing a faith that lacks confidence or trusts too little. Another way to term it is “under-developed faith” as opposed to outright unbelief or distrust. Food for thought: Where are you in your faith walk? Are there different levels of faith? Does doubt keep us from experiencing God’s best? Your comments are important to me. Let me hear what you think about these questions. Father, I thank You for being there for us to help us “walk on the water” of life. Thank You for lifting us up when we fall down; for strengthening us so we can grow in our spiritual lives and for giving us the victory over the battles of life. You are God! There is none above You or beside You. You are the One who brings us through to victory! Thank You, Father, for Your peace in the midst of the storms. And thank You for giving us the ability to focus our eyes on You and win over the enemy’s fiery darts that try to bring us down and defeat us! In Jesus’ name I pray. Amen. Do Not Despise The Day Of Small Beginnings! Matthew 10:1 And when He had called His twelve disciples together to Him, He gave them power over unclean spirits, to cast them out, and to heal all kinds of sickness and all kinds of disease. Jesus sent His twelve disciples out among the people after He had anointed them with His power. He gave them specific instructions of where to go and what to do. God doesn’t expect us to do a job that He has anointed us to do. He will always equip the called. If you are trying to do God’s work under your own power and ability, there will be no anointing to succeed. Man’s ways do not achieve the success that God has through His anointing. With that being said, I was reminded of the story of the man who was walking along the beach after the high tide had come in and deposited a great number of starfish on the beach. They were all lying out in the direct sunlight dying from lack of water. The man was walking along trying to pick them up and throw them back out to sea so they wouldn’t die. Another man came along and chided him for trying to pick up all the starfish. He said, “What you’re doing is of no use, you will never be able to get all of them picked up and thrown back out to sea. You might as well quit, you won’t be able to make a difference in them; there are too many.” To which the man replied, as he picked up a starfish and flung it out to sea, “made a difference to that one.” You see, it’s not that God expects us to save the whole world, or be able to minister to every person on the face of the earth. But He has given each one of us a sphere of influence; a place to make a difference in the hearts and lives of maybe just one person or a small group of people. Some are given a few to minister to and others are given larger groups of people. But if we all do our part, the world will be reached with the gospel of Jesus Christ. What has God done for you that you could give to someone else? Has He given you a testimony? Of course, He has. You may not think it’s anything, but God has done something in your life that you can pass on to someone else. We’ll never know the impact we’ve had on the masses, through ministering to the individual, until we get to heaven. Maybe God has anointed you to pray for people, but you don’t see that as important as the ones who minister the word of God or have a great healing ministry. But God sees your part as just as great a ministry as the one who is out in front of the people. 1 Corinthians 5:5-8 Who then is Paul, and who is Apolos, but ministers through whom you believed, as the Lord gave to each one? I planted, Apolos watered, but God gave the increase. So then neither he who plants is anything, nor he who waters, but God who gives the increase. Now he who plants and he who waters are one, and each one will receive his own reward according to his own labor. We are each nothing in and of our own power or initiative. God is the one who gives the increase; the One who brings in the harvest. Some of us plant and others water the seed sown in people’s lives, but God is the One who gets the credit for changing them; for working miracles in their lives. He is the One to be praised and exalted, not the one doing the ministering. If we will each be faithful with the sphere of influence He has given us we will be rewarded for doing our part and not trying to move over into an area to which He hasn’t called us. Our part is to listen to His voice, obey as He instructs and leave the results to Him. As we are faithful to minister in the little things, God will bring more and our sphere of influence will increase. God looks at the faithfulness of your heart in relation to how you respond to the needs of those around you. If you are faithful in ministering to the “little” people, or small groups, He will give you the “masses”. There are no overnight “world-wide” ministries born. Every minister begins where He is, touching the lives of the people around him. As he is faithful with the few, God moves him into larger areas of ministry. Father, I thank You for every opportunity that You give me to share Your word or Your healing touch with another individual. You are awesome and I thank You for including me in Your ministry to those around me! Thank You for bringing the ones to me that You want me to touch for Your kingdom and glory! Father, I pray that we will all be aware of the opportunities that You place in our midst. Help us to see people as You see them; to be able to recognize when they need a smile or an encouraging word. Father, don’t let us pass by those who need to hear a word from You through us. Cause us to be bold in our witness and ready to minister to whomever you bring to us, whether it’s one person or a thousand. Give us eyes to see as You see, hearts of compassion for the lost and hurting, and boldness to step out in faith believing that You will flow through us as we obey Your directions. Thank You, Father, for Your anointing to minister. In Jesus’ name I pray. Amen. Isaiah 40:27, 28 Why do you say, O Jacob, And speak, O Israel: “My way is hidden from the LORD, And my just claim is passed over by my God”? Have you not known? Have you not heard? The everlasting God, the LORD, The Creator of the ends of the earth, Neither faints nor is weary. His understanding is unsearchable. Has it ever seemed to you that God didn’t know where you were or what you were going through? That it seemed as though He had just forgotten about you? I think we have all felt that way at some time or another. But the word says that He never faints, nor is weary and His understanding is unsearchable. He understands everything about us. He never tires or becomes weary in dealing with our problems. He is the One who is always there for us! He will never fail to pick us up and carry us through the difficult times. Isaiah 40:29-31 He gives power to the weak, And to those who have no might He increases strength. Even the youths shall faint and be weary, And the young men shall utterly fall, But those who wait on the LORD Shall renew their strength; They shall mount up with wings like eagles, They shall run and not be weary, They shall walk and not faint. He gives power to the weak! Power – Hebrew word koach; Strong’s #3581 definition – strength, force, capacity, power, wealth, means, or substance. Generally the word means “capacity” or “ability,” whether physical, mental, or spiritual. God looks into your situation and sees exactly what you need. Then He gives you whatever power it is that you need. It may be strength for your weariness; the capacity to obtain financial means; or the force to withstand a difficult situation. Whatever it is that you need in your situation is what He provides. He knows exactly where you are and what you are going through! Be assured that He will provide the “power” for your weakness! He increases strength when you feel as if you have none. Even those who are young and strong can’t withstand all the things that come against them. But when God comes on the scene they are able to soar above the difficulties and run as though they were never wearied. Their stamina is increased as if they are renewed in strength for the journey! The way that all this comes to you, Child of God, is through “waiting” on the Lord! Wait – Hebrew word qavah – means to wait for, look for, expect, hope. Qavah expresses the idea of “waiting hopefully”. A good illustration of “waiting on the Lord” is of my little granddaughter waiting for Grandma to come see her for Christmas. Before I got there I got a call from my son saying she was standing at the window watching for us to come up the driveway. She had been saying that Grandma was coming all day long and she was waiting with expectation for Grandma to appear. She didn’t sit in the chair and say “maybe Grandma will come today”. She knew that if Grandma said she was coming that she would be there any minute. She waited with expectancy for Grandma’s word to be fulfilled! That’s how we wait on the Lord. It’s not a passive inactivity, but a hopeful expectation that God will do what He has promised. We think about what He has said, we talk about what He has promised and we expect it to come to pass. We expect Him to do what He has said He will do! We all go through times where it seems that what we have believed God for will not ever come into manifestation. It is at those times that we have opportunity to grow weary. There is a “due season” for every seed that is sown. We have seed-time and harvest. We plant the seed, wait for it to germinate and mature and then we receive the harvest. While we are hopefully waiting on the Lord, expecting Him to fulfill His word in our lives, we need to be busy doing good. We should be about the Father’s business during the “waiting” season. Season – Greek word kairos – Strong’s #2540 definition – opportune time, set time, appointed time, due time, definitive time, seasonable time, proper time for action. Kairos describes kind, or quality, of time. Due season, kairos, the proper time for action, the set time before the manifestation of the promise. While we are waiting on the Lord we should understand that it is not a time to grow weary, lay down on the job, or have a negative attitude; but it is an opportune time to do what God has called us to do; to continue doing the right thing in our situations, expecting God to fulfill His word to us at any minute. Friends, God has a perfect plan for your lives; and a time for every purpose in that plan. He knows all about you and is working in your situation to bring into manifestation those things that He has promised. 2 Chronicles 16:9 says that “the eyes of the LORD run to and fro throughout the whole earth, to show Himself strong on behalf of those whose heart is loyal to Him”. He is watching the loyalty of your heart so He can come to your rescue, to show Himself strong on your behalf. He sees your heart; He is not sleeping on the job or failing to notice the pain that you are experiencing. Don’t give up on Him. Lean on Him; rely on Him and depend on His faithfulness. The Lord is good to those who look for, expect and hope for Him. He is moved by our faith, not our need. He sees the need in our lives, but He responds to our faith in Him. The two responses of faith are believing that God is who He says He is; that He is the Lord God Almighty, the Creator of the universe and all creation. The second response is believing that the Lord will reward you for diligently seeking Him. When we wait on the Lord we are saying to Him that we believe in Him; we are expecting Him to do what we have asked of Him and we look forward to the manifestation of it with hopeful expectancy! Are you waiting on the Lord for a promise to be fulfilled in your life today? If you will do your part, in exercising your faith, to believe, He will do His part to fulfill the promise. Father, I thank You for never sleeping or growing weary in handling my problems. Thank You, Lord, for giving me new strength as I hopefully expect You to do what You have promised. Father, I am thankful that You have given me the measure of faith and as I exercise that faith You cause it to increase. Thank You for strengthening me when I grow weary and for giving me the power that I need to meet the situations that I face in life. I pray for my friends, Father, that You will renew their strength as that of the eagle that they might soar above their problems. I pray that they will trust You to handle every situation that they face in life. And I ask You to give them a new awareness of how You are working in their lives. Thank You, Father! I believe I receive when I pray and I ask these things in the name of Jesus! Amen.